The Mixing Assembly consists of series of paddle type blades of appropriate shape to move the material back towards the center of the container. The paddle type blades are provided on the central shaft which runs through a hollow shaft on which other sets of blades are welded. Both the sets of blades intermeshed with each other and rotates in clockwise and anti-clockwise direction respectively and one sets also scraps the container wall for thorough and uniform mixing of the material. Teflon block scrapper design Lotion And Shampoo Mixer are very efficient and maintenance free mixer. Our special emphasis is on product shine, Improved quality and reduced batch time. Every new product is born in the lab - every new process is born in small batches, but often evolves into large scale production. Thermotech uses this knowledge to your advantage and expands the product range for the cosmetics industry with innovative machines and equipment that will help you tap into new markets. With machines ranging in size from lab to pilot, Thermotech offers you the accurately functioning pattern to realize your production idea. Thermotech versatile mixing technologies improve the dispersing quality. This decreases production times and therefore increases your company's productivity. Experiences in the lab can be reliably transferred over to the actual production scale. After all, regardless of their size, Thermotech machines of any series achieve consistent results. Several different mixing systems are available for the production of O/W, W/O, W/O/W emulsions, suspensions, particulate matter, and colloidal substance solutions. The most challenging task innovative mixing technologists are faced with is the production of stable and effective emulsions. Here, Thermotech has extensive experience and world-wide references. A classic cosmetic emulsion is meant to preserve or build up the acid mantle and permeation barriers of healthy skin. Modern cosmetic emulsions additionally contain specific ingredients that influence the skin cells' processes. This is why maintaining the current hygiene standards during the production of cosmetic products are of utmost priority to Thermotech. 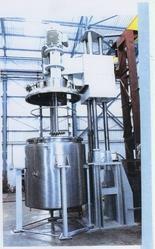 Thermotech Standard Production Plant is ideal for optimally producing liquid-liquid or solid-liquid mixtures. This high-quality and reasonably-priced machine is universally useable and works in an extremely economic fashion. With this batch machine's top design you will profit from high flexibility and excellent ease of use. We are engaged in offering our clients with a qualitative range of High Speed Toothpaste Mixer. Looking for Toothpaste Mixer ?